Hypnotherapy is a simple easy way to help you to retrain your mind to stop thinking like a smoker and enabling you to get back your own personal power. After all, were you not a non smoker for the early years of your life? Hypnosis has often been described as akin to day dreaming something between being awake and asleep. It is a totally non invasive therapy with by far the highest success rate of all anti smoking treatments. We often begin smoking when we are just teenagers and because of the nicotine content in the cigarettes we become addicted very quickly. By the time we are in our twenties we usually start to look at smoking in a different light. How much money is it costing us? How bad does our breath, hair and clothes smell? How awkward we feel needing to smoke in public? When we go on to have children the problem increases. We become aware that we do not want passive smoke anywhere near our children. We often develop a smoker’s cough or start to notice other physical symptoms. You probably are already thinking of quitting smoking otherwise why would you be here! but here is a list of common reasons I often come across while treating clients. Do you dislike the smell of stale tobacco on your clothes your hair and breath? Do you hate looking at and cleaning up blackened smelly ash trays? Are you sickened by that taste in your mouth and that early morning cough? Is it an effort to climb steps or walk any distance without huffing and puffing? Are you worried about the consequences passive smoke may have on your children`s health? Have you noticed lines appearing around your mouth your skin feeling saggy and dry and how the bags under your eyes are getting more pronounced? 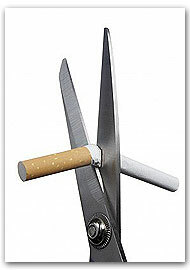 Do you know that smoking actually increases your stress levels rather than reducing them? Are you familiar with the fact that each cigarette contains a ¼ of a teaspoon of sugar? Do you enjoy getting icy cold and soaked whilst huddling with other smokers outside of your place of work? Do you dislike being excluded from most restaurants and pubs? Do you feel ridiculous standing in the allocated smokers box at the airport whilst you are waiting for your flight? Are you aware that 1 in 4 smokers die of smoking related illnesses like emphysema or lung cancer? Do you despise going out on damp, windy, freezing, nights because you are at the end of a packet and fear you won’t be able to last without a cigarette until morning? Does a bad odour hit you when you walk into your house necessitating a hunt for sprays, joss sticks and scented candles? Does your car smell bad too? Do you find it essential to spring clean and decorate your house more frequently than you would really like to because tar seems to stick to everything? Are you fed up with your hard earned wages going up in smoke? I suspect you have agreed with many of the reasons for quitting on the long question list above. But don’t worry I`m here to help. I genuinely believe that it is important to give support to people who wish to stop smoking. By helping smokers to get back their own individual control they become more in tune with who they really are. Smoking to me means loss of personal power. Anything that makes us dependent is taking from us whether it is drugs, alcohol, cigarettes or a destructive relationship. I am sincerely passionate about helping people to stop smoking because I believe that it is the first step to true personal empowerment. The Hypnotherapy session lasts 2 hours and you are given a recording of the session on C.D to take home with you. I also provide telephone support for my clients during the first month after the treatment should you need it. Full client commitment is of course essential to help ensure positive results. When you book your appointment you may request the use of a specific therapy, or you may prefer a combination of different healing methods to help.